One color and one player have always been synonymous with the Denver Broncos. But there’s much more to the history of the franchise than a bright hue and a gunslinger from Stanford. 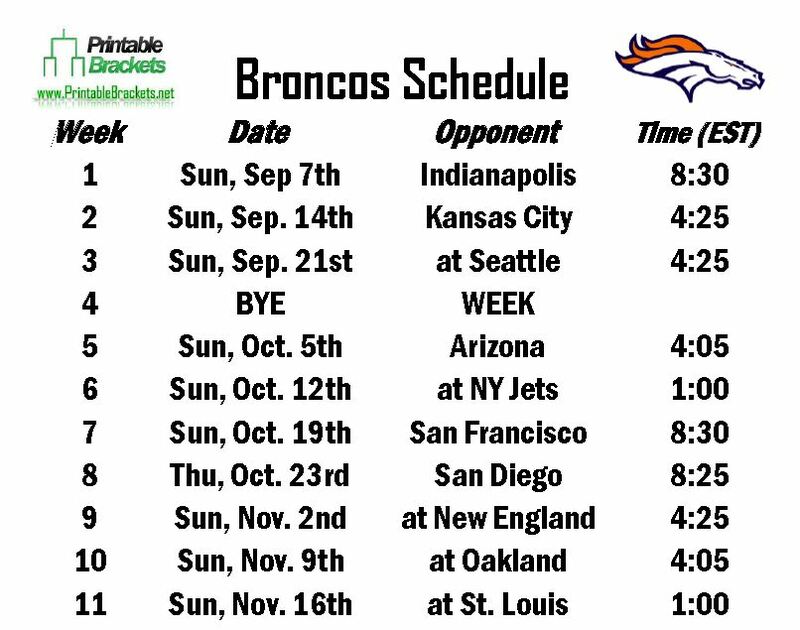 Before analyzing the upcoming Broncos schedule, let’s take a closer look at their past. The Broncos joined the NFL during the merger in 1970. Denver is one of the eight original franchises that made up the American Football League. The Broncos enjoyed little success until the “Orange Crush” defense helped guide them to their first playoff appearance and AFC title in 1977. However, that team suffered a 27-10 loss to the Dallas Cowboys in Super Bowl XII. The course of the franchise changed forever upon the arrival of quarterback John Elway. The Baltimore Colts selected Elway with the first overall pick in the 1983 draft, but he refused to play for the team. The Colts would ultimately trade Elway to the Broncos in May of that year. Elway would go on to become one of the greatest quarterbacks in NFL history. Elway led the Broncos to Super Bowl appearances in the 1986, 1987 and 1989 seasons, but the team lost all three games. Elway and the Broncos finally broke through when they defeated Brett Favre and the Green Bay Packers, 31-24, in Super Bowl XXXII. It was the first of two straight championships for Elway, who retired after winning Super Bowl XXXIII. The Broncos had little playoff success following Elway’s departure, going 1-5 in the postseason from 1999-2010 with quarterbacks such as Jake Plummer and Brian Griese. In 2011, Tim Tebow led the team to a stunning overtime win over the Pittsburgh Steelers. However, the celebration was short-lived as the Broncos were crushed by the Patriots in the divisional round. During the 2012 offseason, the Broncos made the biggest headlines by signing quarterback Peyton Manning. The future Hall of Famer led the Broncos to Super Bowl XLVIII, but they suffered a 43-8 loss to the Seattle Seahawks. While Manning is now the man under center, Elway is still with the team as the vice president of football operations.